I arrived back in the UK last Wednesday and have just spent a few days in the Lake District. Today was the first of my six Sundays away from Tokyo, and my first visit this summer to a church wherever I happen to find myself. The morning didn’t start well. I had checked service times at local churches and had found that St. Mary’s has an 8am Eucharist. Perfect. I liked the idea of attending an 8am service, as usual. However, when we arrived shortly before 8 there was a notice on the noticeboard saying there was NO 8am service this week and next. A pity that notice didn’t make it as far as the church website. Not to be beaten I returned at 11 and this time was successful in attending a service. I received a warm welcome and had short chats with 2 men who were at the back of the church; one was in charge of the sound system, the other I think was just on hand to be sociable. Through them I found out that the church was Victorian, about 200 years old. When I commented that it was not as dark as I would expect for a church of that era Mr. Sound System explained that the church had been refurbished (did he say repurposed?) about 6 years ago, and the old dark flooring and dark pews had been replaced, and the walls painted. It really was a light-filled space. I heard also that the screen that the music is usally projected onto was not working, so we had sheets with he words instead. Thank goodness. I’m not a fan of screens and projectors in church. Mr. Sociable directed me to the side of the church where there were a lot of leaflets and pamphlets available in a variety of languages. I picked up several in Japanese. He also told me that the church has a lot of visitors on any given Sunday. Last week the ratio had been one third regulars and two thirds visitors, but usually it’s reversed. I had a wander round the church, took a few photos, then sat down and watched preparations for the service. I had a look through the service book, and discovered it was one of the simple and modern Eucharistic Prayers from Common Worship. Nothing tricky to navigate there, then. St. Mary’s is in the middle of an iterregnum, so they have no rector and the priest was the assistant priest (as listed in the notice sheet). There was a bit of faffing at the begining of the service, a few announcements, housekeeping stuff, and then we started the service. – The hymns were a bit of a mixed bag, some traditional, like Dear Lord and Father of Mankind, and others that were clearly more modern. All the regulars seemed to know the modern ones, though. – There was no Epistle reading. We went straight from Exodus to the Gospel. We stood for the Gospel but as far as I could tell it was read by a layperson. 1 Tp sepnd more time in silence and maybe even incorporate it more into worship. Here, he felt, was where people really could meet God. 2 To welome visitors and really listen to them. 3 To be part of the wider community, to not stay inside the church and lob ‘holy grenades’ over the wall regarding issues the church and its people felt strongly about, but instead to really engage and actively promote the church and its image in the town. From there we moved to the intercessions, which were quite long and a bit of a bush telegraph. In the middle we were all required to ferret out our weekly notice sheet to recite the ‘interregnum prayer’. There was, I felt, quite a focus on local people and giving extra information. It made the intercessions longer and didn’t feel prayerful at all times. 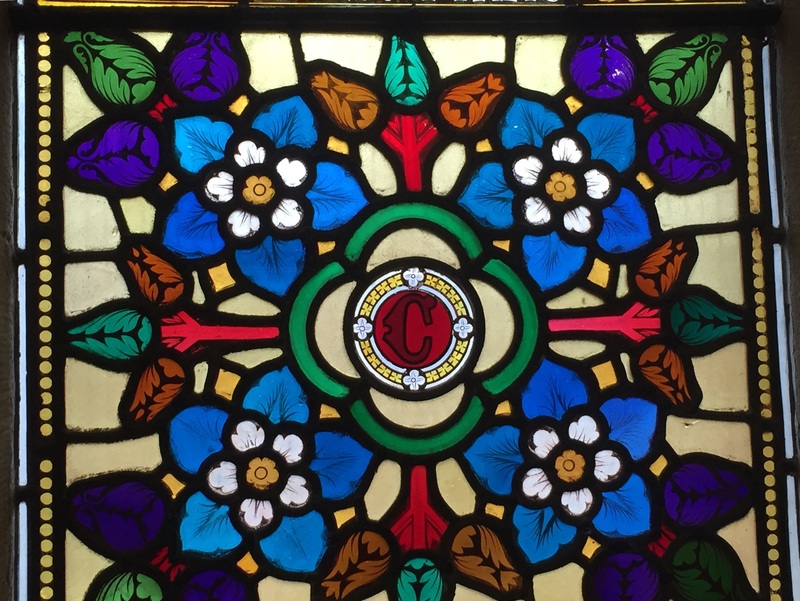 Then we had another hymn, Dear Lord and Father of Mankind, while the bread and wine were prepared for the Eucharist. There was no collection. A plate had been left out before the service with a notice explainign that there would be no collection taken during the service, but at the end of the hymn the plate was carried up to the altar. I rather liked that, it seemed a better way than the pressure of the passed plate, but at the same time I wondered if the church received less because of it. The Eucharistic Prayer was relatively short (I would say definitely no longer than the intercessions) and then we all received communion. While everyone went up the the altar rail there was a vaguely Celtic recorded version of When I Survey The Wonderous Cross which I could have one without. A bit of that silence the priest had mentioned would have been better. The wine was not wine but red grape juice. After everyone had received comunion we said the post communion prayer and then were blessed. It was a pleasant service, and nothing was rushed. Everyone seemed friendly, they seemed more practiced in the art of welcoming visitors than some churches I’ve visited, but given their loction I suppose that makes sense. I liked the sermon, and the general atmosphere, and the church is lovely. I was less keen on the mixture of hymns and the long-winded intercessions, and I would have liked to have heard the Epistle read too. Remember the day of rest is for worship and socialising. Please try to do your Church, Parish Centre and school business on the other six days of the week. I thought that simple reminder was something every church could well include in its weekly bulletin. 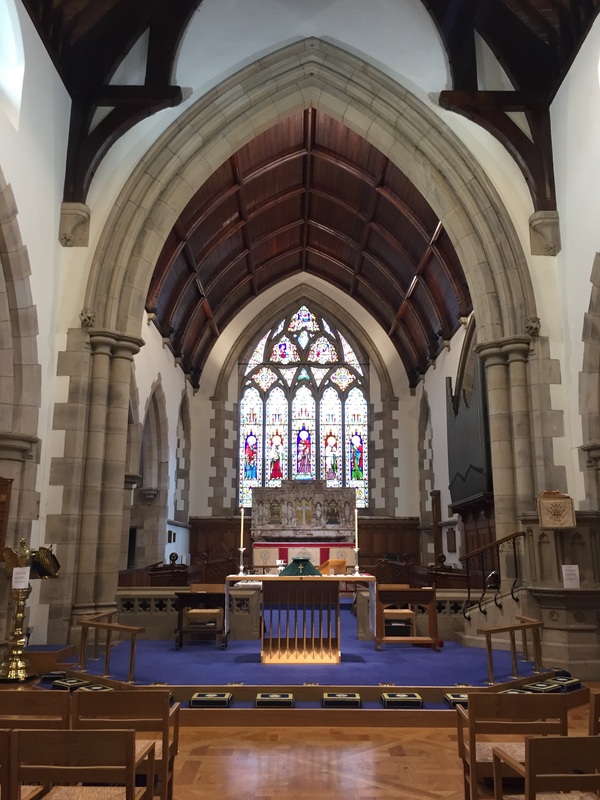 This entry was posted in Travel and tagged Common Worship, Dear Lord and Father of Mankind, Eucharist, Lake District, St. Mary's Ambleside by tokyopurplegirl. Bookmark the permalink. I like points 1, 2 & 3, especially point 1. We seem so afraid of silence and stillness but how can we possibly hear or be aware of the ‘still small voice’ in the hubbub that otherwise surrounds us? Practicing ‘being still’ helps me to be present in the moment and to have awareness of the ever present Grace of God. The opportunity for a reality check on what is really important vs what keeps me busy. We observed with a deep sigh the number of churches without clergy on our visit to Cumbria. Churches locked, almost barricaded against the hooligan element. Perhaps a sign of the transient ‘second home’ majority now inhabiting the Lake District and resulting breakdown in community and service to others. Which might otherwise interfere with our striving to emulate our TV reality show and soap opera heroes.